For maturing or sun damaged skin. (Not designed for sensitive or rosacea prone skin types). This advanced weekly home peel dramatically reduces the visible effects of sun damage by lifting dead, dull surface cells and softening uneven pigmentation to reveal a smoother, brighter texture. When combined correctly with EcoSmooth exfoliating scrub and Good Night overnight repair masque you will experience extraordinary, professional results. Skin's texture is dramatically transformed and begins to remember its once youthful smooth supple architecture. 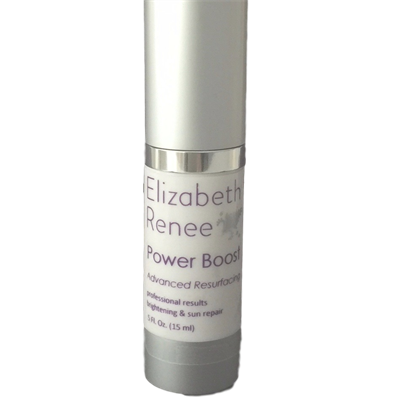 This powerful lactic acid based formula not only lifts surface discolorations and softens visible lines, but hugely improves overall skin hydration. A high potency AHA - 25% Lactic Acid (known for its brightening and hydrating qualities), combined with deeply hydrating, soothing and brightening antioxidants from licorice root, chamomile, aloe vera and panthenol. Designed as a once a week home peel. Not to be combined with other AHAs or Retinol in the same sitting. Preferably used at night. Apply 2-4 pumps to freshly cleaned and toned skin, avoiding the area around the eyes and lips. Leave on ten minutes to dry. Some stinging may occur and is normal. Rinse off if excessive stinging occurs and consult your esthetician to modify instructions. Remove by applying EcoSmooth scrub in gentle circular motions directly over Power Boost for 30 seconds, then rinse thoroughly and tone. For best results on dry, sun-damaged skin; follow up with a generous layer of Good Nite reparative sleeping masque, which can be left on and rinsed off in the morning. *PERFECT WHEN USED IN-BETWEEN MONTHLY SPA PEELS. Beautiful Skin by Elizabeth Renee Esthetics.